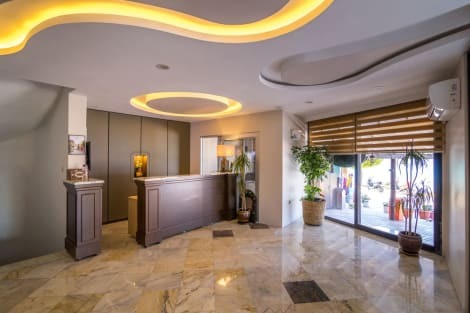 With a seafront location next to Limani ferryboat jetty, Liman Hotel provides panoramic views of Kuşadasi Bay from its traditionally decorated rooftop terrace. It offers rooms with balconies and free WiFi. Each room is equipped with a satellite TV and a private bathroom with shower. They all feature tea/coffee making facilities. Room service is also available to all rooms. Guests can enjoy a traditional Turkish breakfast on the rooftop terrace, while admiring views of the harbour and coastline. Turkish cuisine and drinks are also on offer from the restaurant. A small library full of local information and free maps is available to guests. The property also features a barbecue facility and a children’s playground. Kuşadasi Beach, with plenty of water sport activities, is just a 5-minute drive from the Liman. Located on a hillside, this hotel lies close to the centre of Kusadasi. It affords wonderful panoramic views out over the marina, Port and across to Pigeon Island. A bus stop offering a regular service to the centre of the resort is to be found directly before the hotel. The nearest beach is 900m away and it is approximately 70 km to Izmir airport. This family-run hotel comprises a total of 62 rooms spread over a main building and an annexe block. Amongst the facilities count a foyer with a 24-hour reception desk, a currency exchange facility and a café. Further facilities include a bar, a restaurant and conference facilities. All of the rooms are well-equipped as standard featuring an en suite bathroom with a hairdryer, and a balcony or a terrace. Leisure amenities include a swimming pool with a children's paddling area and a sun terrace with sun loungers and parasols. Make yourself at home in one of the 60 air-conditioned rooms featuring minibars and LED televisions. Rooms have private balconies. Complimentary wired and wireless Internet access keeps you connected, and satellite programming provides entertainment. Bathrooms have showers and hair dryers. Satisfy your appetite at one of the hotel's 2 restaurants. Relax with your favorite drink at the bar/lounge or the poolside bar. Featured amenities include express check-in, dry cleaning/laundry services, and a 24-hour front desk. A shuttle from the hotel to the airport is provided for a surcharge (available 24 hours), and free self parking is available onsite.